Periodontal disease is the scientific name for all gum disease, ranging from gingivitis to periodontitis. Gingivitis is inflammation and swelling of the gums; periodontitis is the last stage of periodontal disease when the ligaments that attach a tooth to bone are inflamed and infected as well as the bone itself, usually resulting in tooth loss. Alternative treatments can prevent and aid in the treatment of periodontal disease. While dental professionals cite other causal factors (smoking, hormonal changes, genetics, diabetes), there is little to no recognition that the mouth is one part of an entire system. According to them, there is one cause and one treatment path for periodontal disease: the cause is poor oral hygiene; the treatment is through the dentist combined with better oral hygiene. Today, we are re-learning the simple truth: when it comes to health, in every part of the body, nutrition is the key. Our bodies were made to fight disease, to maintain a balance between good bacteria, bad bacteria, and yeast. To regain and maintain healthy teeth and gums, eat a nutrient dense diet filled with whole, unadulterated foods of which 80% are raw, organic vegetables and fruits. If you are eating 80% raw, chances are you will be eating an alkaline diet. If your diet is acidic, it will promote disease. Sugar creates an acidic pH, which causes the blood to pull minerals (especially calcium) from the bones and teeth. Sugar is your enemy. You want to heal bone, not degrade it. If you supplement your diet with vitamins and minerals, choose whole food vitamins and minerals so your body can properly assimilate them. 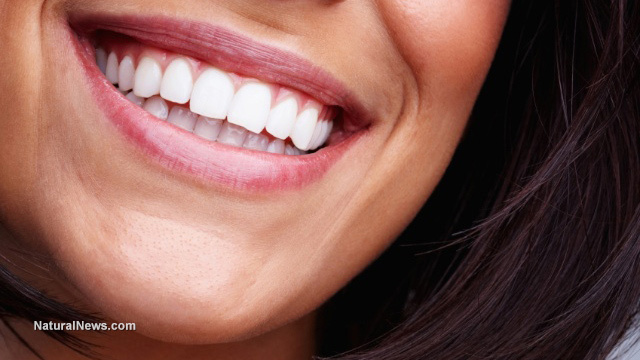 Vitamin D, vitamin C, and B vitamins are essential to dental health. If you smoke, stop. If you smoke anything - stop. Smoking cigarettes or marijuana introduces free radicals and other toxins that damage the gums and therefore encourage and promote periodontal disease. Obviously, chewing tobacco products is even worse. Your diet is key, especially when you have an acute infection. No sugar! Sugar feeds bacterial infections and feeds yeast infections. When your gums are infected and you eat candy, your gums will hurt more. If the infection is severe, they will hurt a lot more - now and later. You just fed the infection. Now, what else can you do for immediate relief and healing? Keep your mouth clean. Brush after eating. Get a new toothbrush and brush correctly, not just the teeth, but the gums as well. Stop brushing your teeth with toxic chemicals. Buy good natural toothpaste or make your own. Floss, but gently if gums are inflamed. Chew raw garlic. This is not for the faint of heart. Raw garlic has a very strong taste and burns when you chew it, but it works. Chew as long as you can. Practice helps. Add oil pulling to your daily routine. Oil pulling will get in between your teeth and deeper within your gums to help eliminate bacteria and Candida in ways that nothing else can. Take a good, whole food vitamin. (See Make your own Homemade Multivitamin and Mineral Formula) If you are vitamin deficient, one or two days of taking a really good vitamin supplement will make a world of difference. Your gums may stop bleeding and hurting within a day. Here is a link to make your own toothpaste: Heal Cavities, Gum Disease, Naturally. This article also has a recipe for the most powerful natural gum treatments I know of, Shillington's Tooth and Gum Formula, and it also addresses oil pulling and gives instructions.